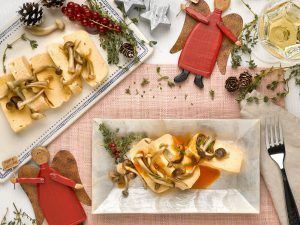 With Corvina REX as the main ingredient and using other healthy foods such as mushrooms, eggs, carrots or leeks you can make an exquisite cold pudding to amaze your guests these holidays. This recipe, even though lengthy (about 90 minutes of preparation), does not involve any difficulty on its execution so we encourage everyone to put on your aprons and prepare this delicious Corvina and mushrooms pudding. Through a few simple steps, you will get a delicate starter to share -recommended for 4 to 6 people depending on the rest of the dishes- whose lightness makes it perfect to balance the copious meals and dinners of these days. Remember to ask your fishmonger to clean your Corvina REX fillets from bones and skin, that way to prepare this pudding will be a “piece of cake”. A sophisticated dish but very easy to prepare, by which you will surprise your guests, but above all that it is also a very complete nutritional source due to the high protein value provided by corvina, egg and mushrooms. Additionally, its ingredients are a good source of B vitamins, essential for the proper functioning of our body. This Christmas bring out the Chef inside you and let yourself be inspired by Corvina REX!